I love how the author is able to take legends or myths and put her own spin on them. I loved this story. It is well written and thoroughly entertaining. I didn’t want to put the book down once I started it. I cannot wait for the rest of the series to come out. 5.0 out of 5 starsGET READY TO HAVE YOUR MIND BLOWN!! OMG! THAT WAS AWESOME! Author Melissa Snark has once again left me speechless with her master storytelling abilities. I for one can not wait for the next book in this series!! I would recommend this book to every one (18 years and older)! And I wouldn't change a thing about it!! There are so many revelations revealed in this book, it really will blow your mind. No joke, this is my number one favorite series. 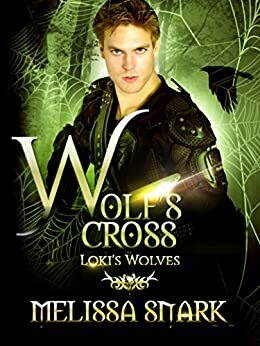 Author Melissa Snark has perfected her craft with her strong characters, action, magic and mayhem, the depth of which she builds her stories and the ability to follow the story line. She's crossed all her T's and dotted all her i's. An epic and brilliant book. And I know the next one will be just as good if not better! And OMG I CAN NOT WAIT! I couldn't write a blurb without giving spoilers and I don't/won't give spoilers. I received an ARC in exchange for an honest review. 5.0 out of 5 starsAn extraordinary adventure! Wolf's Cross is a vivid and complex tapestry skillfully woven by Melissa Snark. At first, everything seems in flux in this story. It is difficult to determine who is truly your friend and ally and who is the enemy. The Nordic gods may seem fickle, but we know little of their plans for the mortal realm. They present a conundrum! Bit by bit, the patterns are revealed. It's best to delve right in and follow the ribbons of story where they lead you. I assure you it is an extraordinary adventure! Many great passages come to mind, but my very favorite is the last scene in the book. Do read it! I received an author's copy in exchange for an honest review. This has been the best one in the series so far. So many things are going on in this book that it keeps you on the very edge of your seat the whole time reading. I'm also so glad to see a certain someone return! Can't wait for the next installment! This was such an exciting book. I really enjoyed reading it. One of those books you can't put down until you've finished.